No matter where I am or who I am with, the conversation eventually turns to travel. It’s what I’m passionate about, it’s what I know the most about, and it’s what I do for a living. Travel is also something that most people would like to do more. When talking with friends and relatives, or even with new acquaintances, certain questions come up again and again. How do you travel so much? How do you travel for so little money? When is the best time to travel for less? How do I save money on flights? The first two are easy to answer. I make travel a priority in my life and use miles and points to cover as much of the cost as possible. When it comes to the last two questions, the answers get a bit more complicated. That’s what we are going to take a look at today. 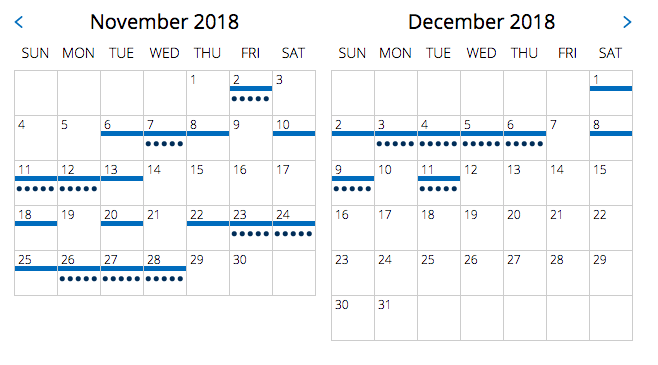 Below, we will go over the best and worst times of the year to fly, the best and worst days of the week to fly, and the best times to book your flights. By the end of this post, you should understand how to save a bit of money when booking your flights, so you have more to spend at your destination. When we talk about saving on your flights, most people think only about cash tickets. This is, however, a site all about using points to travel, so we should probably talk about saving points, too. Fortunately, most of the time, the two go hand in hand. The times of year and days of the week when you will find lower prices often match up with the days you are more likely to find low-level award seats. Because of this, we will be using examples from both cash bookings and points bookings in our explanations below. We may show cash prices or award availability calendars, but when we talk about saving at certain times, we are generally talking about both. For U.S. travelers, Sydney is a hugely popular destination for Christmas and New Year’s Eve. It’s no coincidence that the award seat availability out of Chicago searchable on the United site drops to zero seats for the second half of December. You can probably guess the worst times of the year to fly. The best times to fly are the days with less demand for the seats, so that means the worst times of the year to fly are the times with the most demand. These generally include the days around holidays or festivals (in the U.S. or at the destination), sporting events, and any time kids are out of school. Sometimes, holidays and time off from school line up. Those are typically the worst times to fly. Of course, you may not always have a choice in when you travel. Maybe you have kids in school; perhaps you work at a school, maybe you only get holidays off from work. If that’s the case, there are a few things you can try to make paying for your flights less painful. For example, try flying to less popular destinations. 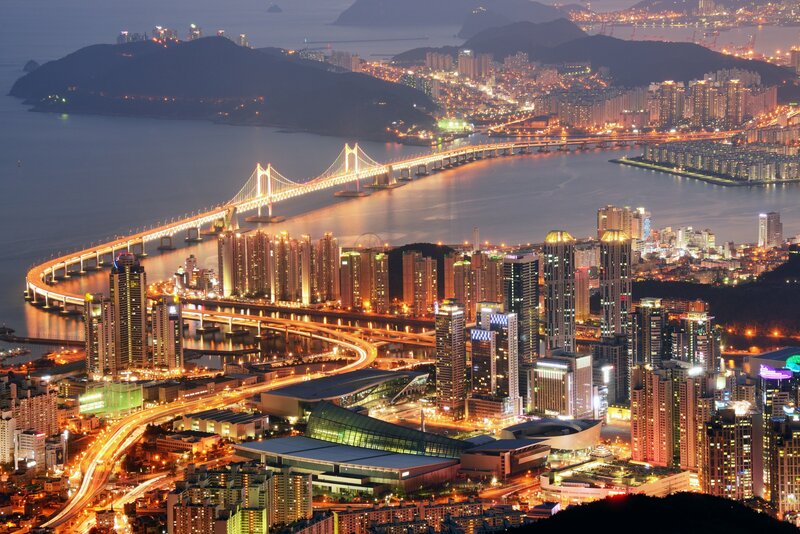 Instead of a beach trip in January, check out a city you’ve never seen before. You can also try varying your flight dates by a day or two. By taking an extra day off or giving up a day of your trip, you might be able to save significantly. To help you know when you may need to try these techniques, below are some examples of the worst times of the year to fly, when you will almost definitely find higher airfares and fewer award seats. Spring Break Timing differs depending on the school, but usually in March or April. Often the week before or after Easter. Weekend days March through April to beach destinations. Summer break Extending from as early as the end of May in the South to the beginning of September in the North. Higher fares typically domestically and internationally. Independence Day July 4 Two or three days before and after, usually only to and from locations known for their celebrations. Significant celebrations in New Orleans, Rio de Janeiro, and many other Caribbean and Central and South American countries occur for Carnival and Mardi Gras. People travel from surrounding areas to celebrate before the beginning of Lent. Celebrations last up to two weeks or more before but typically are the biggest and most crowded the weekend and days before Ash Wednesday. Although smaller festivals happen all over the world, Munich is the place where millions of visitors come together between the end of September and the beginning of October for this massive carnival/fair/beer drinking event. People come from all over the world, so expect higher fares during this time to Munich and surrounding cities. In Europe, the Christmas markets take place from the beginning of September up until the beginning of January, with dates varying depending on the location. Many Americans fly over for a long weekend just to go to the markets, so you can expect higher fares especially around the weekends during this season. Every 2 years, alternating between Winter and Summer Games, the Olympics take place in a different country each time. If you plan to attend, your best bet is to get your flight as soon as possible (especially for award seats) or fly into a neighboring city and take a train or drive to the host city. Every 4 years and in a different country each time, the World Cup is one of the most significant worldwide sporting events. It typically takes place from the middle of June to the middle of July with schedules varying slightly. Qatar is hosting the 2022 World Cup, and due to the country’s climate, will take place from November to December. Expect fares to be elevated from a few days before the first games until a few days after the final, as fans fly from city to city and back to their homes. Taking place on the first Sunday in February, the Super Bowl is one of the most significant sporting events in the United States. Hosted in a different city each year, you can expect significantly higher airfares to the host city for the few days before the game and away from the host city for the few days after the game. Two cities host the World Series, those of the teams playing. Since no one knows what two cities those will be until the previous round of the playoffs is complete, airfares can shoot up quickly as soon as the final teams are confirmed. If you want to see your team, it might be in your best interest to speculatively book some refundable tickets before the final teams are known. If your team doesn’t make it, you can cancel and start hoping for next year. If you want to take a solo trip from Houston to Managua, Nicaragua this fall, there are either economy or premium awards available every single day in October and November. Finding the best times of the year to fly is not just as simple as avoiding the dates listed above in the worst times of the year to fly. Sure, if you can do that, you will likely find lower prices, but we want to find the lowest prices. We want to look at the best times of the year to fly. To find the lowest prices, we need to find the flights with the least amount of demand. Traveling to less popular locations and at less popular times of year is the best way to do so. Of course, destination matters, too. We all want to see the Eiffel Tower and the Sydney Harbor Bridge, but we don’t need a show-stopping attraction like that on every trip. Choosing less popular locations can save you a lot of money. You might be surprised how fantastic your trip will be. Once you’ve picked a destination, it’s time to figure out when you should fly there. Most destinations around the world have a high season and a low season. It’s easy to understand that the high season would be more popular and therefore have higher flight prices. The low season would be cheaper, but there is probably a reason it is the low season. Most often, that reason is the weather. Hot Tip: What many people don’t realize is that in between the high and low seasons, there are what is known as the shoulder seasons. Times of the year where the prices aren’t as high as the high season, but the benefits of traveling in the high season are still mostly there. The weather may be a few degrees cooler on the beach, but it will still be plenty warm enough to enjoy. The shoulder season is what you want to find. Flights will be cheaper, and the destination will still be a great place to visit. Shoulder seasons are not always obvious, but you can get a little help finding them in some locations. Check local hotels, buses, and tour prices. Often, they will have different pricing listed for high season and low season. In the middle of those two, you will find the shoulder season. We would advise you to go right on the edge of when things are cheaper to get the best of the high season at low season pricing. Taking a trip to Nicaragua in the fall, for example, can be a fantastic adventure. Within the span of a few weeks, you can scuba dive with hammerhead sharks, climb a volcano and go boarding back down, whitewater raft through canyons, and see monkeys in the forest. The best part? There are cheap flights, plenty of availability, and since it is a shoulder season in Nicaragua, everything at your destination will be less expensive, too. 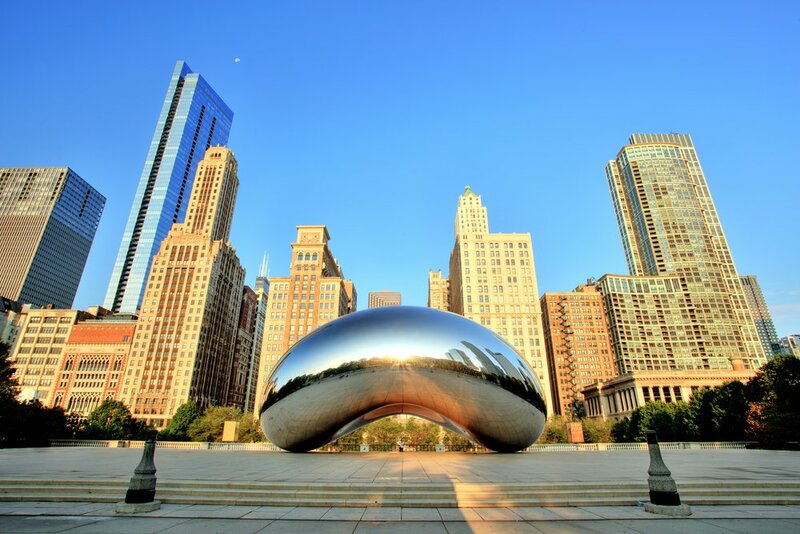 If you want to fly from Washington, D.C. to Chicago this summer, you can see that the best prices are all midweek. Tuesdays and Wednesdays have the cheapest flights in this case. Similarly to the best times of year to fly, the best days of the week to fly are those with less demand. The fewer people who want to fly on a major route on a specific day, the lower your price will generally be. For our best and worst days of the week, we will be concentrating primarily on domestic U.S. travel. International travel doesn’t tend to follow the same patterns in pricing. In fact, it is tough to find any pattern at all in international flight pricing. Domestically, Tuesday and Wednesday are often the cheapest days to fly, with Thursday coming in slightly more expensive. This makes sense if you think about it. These are the three days in the middle of the week. Business travelers are usually coming and going at the beginning or end of the week. Leisure travelers are rarely looking forward to the middle of the week, so they can enjoy their days off. Not that many people have a reason to fly on Tuesday, Wednesday, or Thursday. Hot Tip: If you can move your plans around so that your flights are mid-week, you are likely to save a bunch on your tickets. The same goes for award seats. You are much more likely to find an award seat to New York City midweek on a Tuesday than at the start of the work week on a Monday. 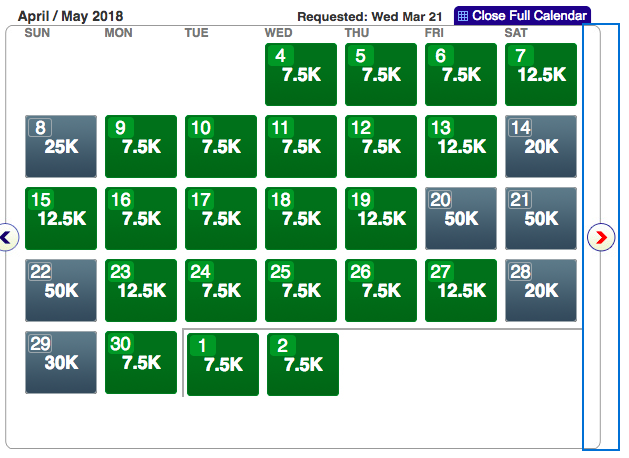 If you want to find 4 award seats on American Airlines this spring, it is easy to see the worst days of the week to fly. Tuesday, Wednesday, and Thursday have low-level availability every day except one. Award prices are higher on most of the other days. Friday, Saturday, Sunday, and Monday are the days with the highest cost and lowest number of award seats. There are two reasons for this, and both of them are relatively simple: business travel and vacations. Domestically, business travelers who spend the week on location are either heading out on Sunday if they want to get a jump on the week or early Monday morning if they’re going to make the most of their weekend at home. Business travelers typically fly back to their home base at the end of the work week on Friday, unless they need to work a full day on location and end up flying home Saturday. Business travel is a huge part of domestic air travel, so you can understand why these travel patterns would lead to more demand and thus higher prices on these days of the week. Vacationers, in a similar manner, most often take a full week of work off. If possible, they will sneak out and take a flight on Friday to take advantage of two full weekends at their destination. If they can’t do that, then Saturday is the next choice of day to fly to maximize vacation time. On Sunday, it’s time to head home and get ready to go back to work on Monday. Vacation travel sometimes extends to two or even three weeks, but most Americans take vacations in full week blocks, and they end up flying on these days. Again, more demand equals higher prices and fewer award seats. You can see in this example of one-way flights from Washington, D.C. to Rome this fall that there is no rhyme or reason to which days of the week have the lowest prices. Over the course of these two months, every single weekday has at least one lowest price flight. Although this is the definitive guide, there aren’t any absolute rules. For every guideline, there are plenty of examples to contradict it. In our days of the week sections, we only dealt with domestic flights. That is because those same guidelines don’t usually apply to international flights, as you can see in the pricing screenshot above. This Chicago to Denver route has low-level award seats available every day except for one on this month-long calendar this spring. Want to go on a Sunday? No problem. Need to fly on Friday? The award seat is there. When it comes to awards, a route with either abundant seats or too few seats can throw the rules out the window as well. 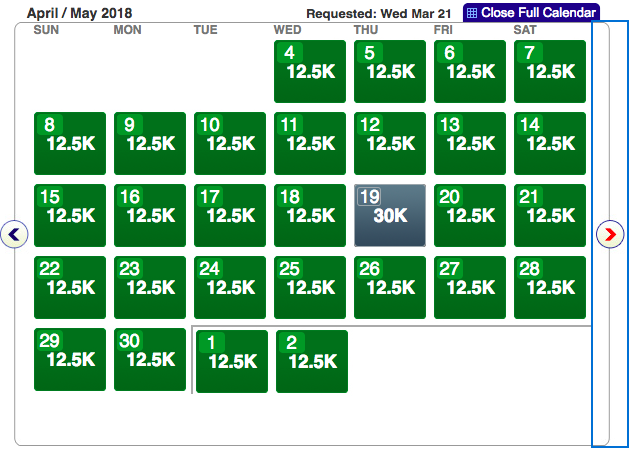 If you want to fly 6 people to Australia in business class, for example, it doesn’t matter what day of the week you go; it is going to be nearly impossible to find those award seats. Other routes have so many flights that there will consistently be award seats available. Almost any day you consider, you will be able to get one or more people on those flights with miles, even on the toughest days to fly. This is an outline of general rules and suggestions for finding cheaper airfare and more available award seats, so these suggestions will not work every single time you try to book a flight. They will, however, help some of the time. If you can save money some of the time, that is far better than always paying a higher price. 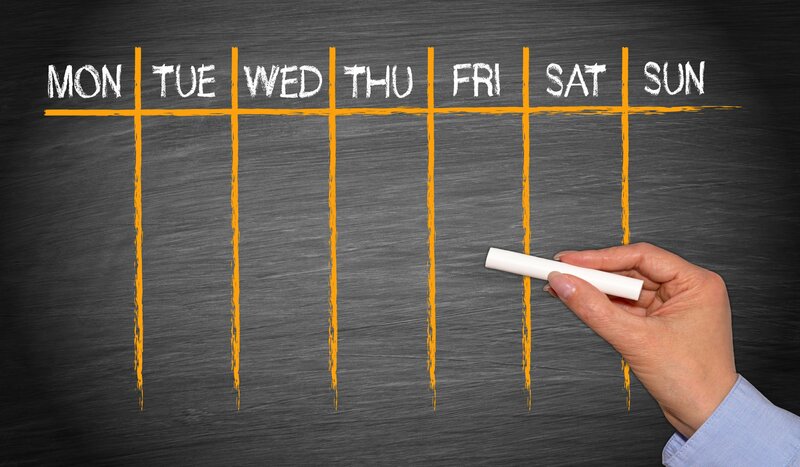 What day of the week is best to book for flight? The answer might surprise you. Over the years, there have been several answers to this question. People used to say Sunday night was the best time to book. Then it was widely reported that Tuesday was the day you would find the cheapest fares. Some places have even argued that the best day for domestic flights is different than the best day for international flights. Unfortunately, there is usually not a whole lot of data behind these reports. Sure, they will often point to a particular study or a survey or maybe even a well-known travel website, but if you look at the sources, the information they use is often not very convincing. The first problem is that when media reports on this topic, it is always a big hit. Everyone wants to know the answer. Increased interest in booking on a particular day can influence pricing. The second problem is that there will never be a single day of the week where all airfare is cheaper than usual. If there were such a day, nobody would ever book on other days of the week. Airlines are continually adjusting airfares based on dates of travel, the popularity of the flights, and a variety of other factors. Each flight has several different fare buckets, and if one sells out, that price is gone. The airlines aren’t going to wait until Wednesday to change the price. The same goes for lowering fares. It happens when the factors dictate it should happen. So if you are looking for a magic answer here, you aren’t going to find it. Sorry. Bottom Line: The most accurate answer we can give you is this: the best day of the week to book your flight is the day that the price is lowest. Unfortunately, there are no consistent patterns, despite what you might have heard or read! By tracking the pricing on a specific flight, you can get an idea of what a reasonable price is for that flight over time. A great way to find the lowest prices for flights to your destinations is to do a little bit of research ahead of time. 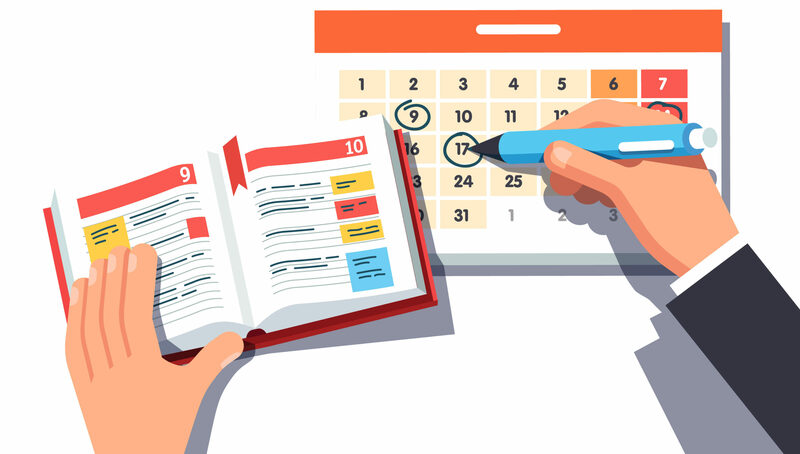 If you need to travel on specific dates, there isn’t too much you can do, but if you are flexible with your dates, looking at pricing history and setting up alerts can be quite helpful. 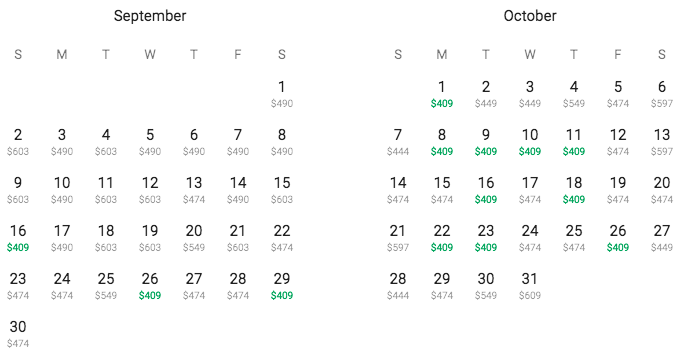 Google Flights is a great tool for looking at pricing. As you can see in some of the images we used above, you can see the pricing of flights for 2 full months at a time. This makes it quite easy to see which days of the week are going to be the best. It also can save you a lot of money by showing you that a day or two after or before your flight will be cheaper. Hot Tip: Another helpful thing Google Flights does is allow you to track prices for specific flights. Once you have done a search and selected a particular flight, you will see a Track Prices button. Selecting this will save the flight, and you will get an email every time the price goes up or down. This is a great way to get an idea of pricing trends for a future trip. In addition to Google Flights, services like Hopper and Kayak offer suggestions about whether it is the right time to buy a flight. They use past data to try to predict whether a flight price will rise or fall in the next week or so. Although these predictions won’t always be correct, they are data based and can help with your confidence when booking flights. As finding cheaper airfare is such a vast topic, this is by no means an exhaustive list of services and sites that you can use to research flights. There are plenty of others out there, and with a little digging, you may find one you like even better than what we have listed. 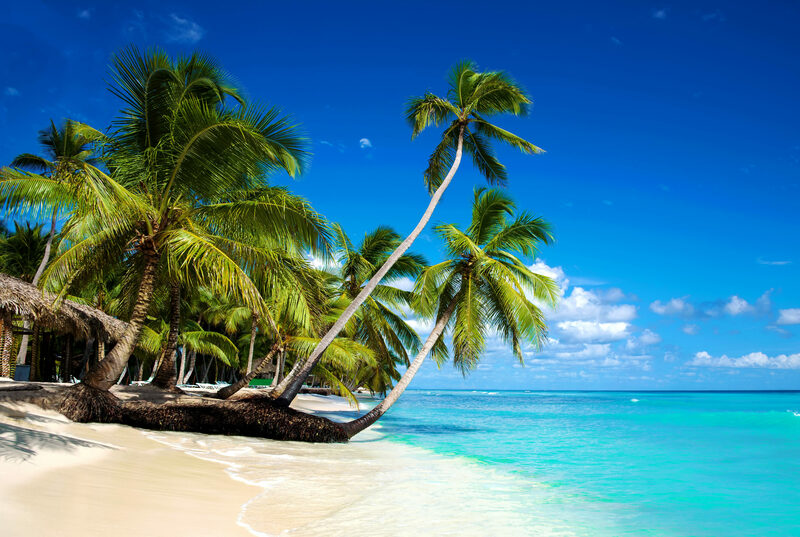 When you are relaxing on a beautiful beach like this one on Sanoa Island in the Dominican Republic, you don’t want to be worrying about the price you paid for your flights. Book a flight you are comfortable with and move on to enjoying your vacation. Finding the best and worst days to fly is far from an exact science. There are so many factors affecting flight pricing that you will never find a definitive formula that can be applied every time you want to book a flight. With that in mind, however, what we have outlined in this post should help you get a broad idea of certain times when it would be possible to save a bit of money on your flight prices. You should also now have an idea of a few times of year when you will have a better chance of finding the award seats you need. With award seats, as with cash bookings, flexibility is critical. 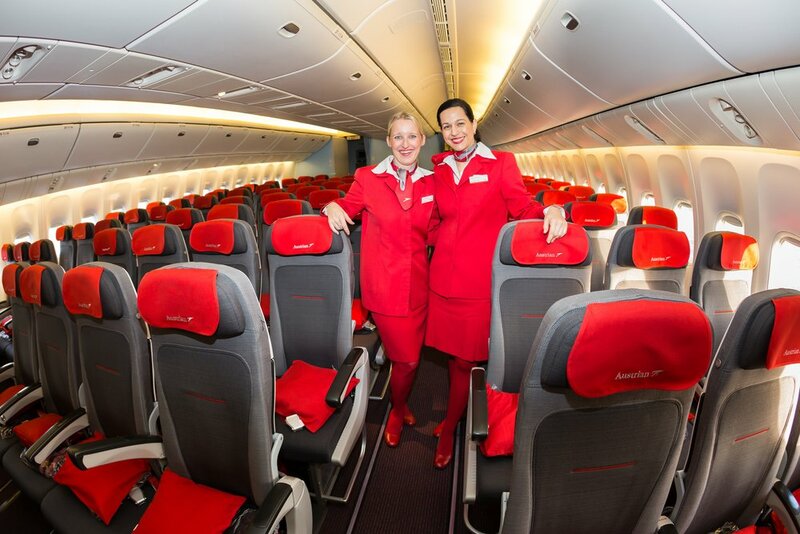 The ability to fly on a Tuesday instead of a Monday might mean that you can find the award seat you want. It could also mean you will save 25 percent if you pay for the flight with cash. Flying in shoulder seasons or to less popular destinations gives you a much higher chance of lower prices and plenty of award seats. Keep these suggestions in mind next time you are booking, but above all, make sure you are comfortable with the price you are paying. If you are happy with the price, book the flight. Worrying too much about saving 10 or 20 dollars will add unnecessary stress to your life, and that’s the exact opposite of what you are hoping to achieve with a vacation. Bottom Line: Find a flight you like and a price you can afford, book your trip, and spend the rest of your time concentrating on the time at your destination. Whether you’re relaxing on a beach, hanging from a zip line, or stuffing yourself with street food, we hope that this post helps you save some money and makes your next trip a reality as soon as possible. One interesting anecdote: a couple of years ago I spent weeks checking daily for two BA First Class award seats from SFO to London in late summer. Then suddenly an idea came: fly the night before Labor Day. Sure enough, we got two seats, because businesspeople would have Labor Day off! I don’t know how repeatable this is, but worth a try. Our rule of thumb is to always head where other people aren’t. Cruise during hurricane season. Fly to Europe in February or September etc. Good tips and accurate. Oh and take advantage of morning flights on weekends out of South Florida. The cruise ship passengers can’t make those 6am flights home so it leaves holes in pricing and awards on Saturdays and Sundays. Love the cruise ship tips there, thank you! Big business locations, like Atlanta, Houston, Chicago, etc., tend to be cheaper on Sat. as most business travelers fly home on Friday afternoons. If you’re wanting to visit a beach location and can fly on the weekend, check the rates of a large city airport that may be just a few miles further than the closest airport to vacation spots. Also be flexible and check out all airports in the area. For example if you want to fly into Raleigh, NC, check the price to fly into Fayetteville, NC, an hour away, and you’ll often save. If you can fly Southwest, pull down their calendar and check their “Gotta get away” fares. They have great deals and flying into Dallas Lovefield is so much easier than flying into DFW. Question: when possible, would you recommend booking weeks/months prior to travel or wait and watch, possibly getting within days? Thanks for the question, Margot. Others may have different views but I don’t think there is a single rule as to how far in advance you should book travel. For instance, you might want to book award tickets as far in advance as possible to find space available but seats can also open up last minute. You might find a super deal on a flight next week, next month, or next year. If the price and schedule are right, I go ahead and book it. You can certainly check Google.com/flights and use the calendar to view fare prices far in advance and this can help with your decision. Also, some airlines do refund some of the difference if a fare drops down low enough, after you purchase it, that it exceeds the change fee.